﻿Let’s take some time, maybe a minute or two, and imagine the perfect place where you can exist being your most authentic loving self without fear, regret, worry, hate, etc. How do you look? What are you wearing? What kinds of things are you doing? Are there people you’re talking to? What does this place look like? Is it familiar? How does it feel like to be in this utopian space? What do you see? Are there particular or familiar smells? How does it make you feel, imagining this perfect world? Utopias are societies where communities exist in harmony with no divisions or divisiveness. Doesn’t that sound ideal? It’s no surprise that as Pride has come and gone, I think about my own ideal society. One where everyone is free to be their own genuine, honest, transparent self without apologies, restraints, or labels. A utopia where everyone lives authentically and is at peace with themselves as well as the world around them. For the LGBT+ person, living authentically is probably one of life’s biggest challenges. We live in such a hyper-competitive, judgmental and critical world and that takes a toll. We’re bombarded from birth with homophobic messages. Whether it was about sexuality, gender norms or gender expression, the message was the same. We’re unacceptable. We’re judged every moment and we are found lacking. And that’s where living authentically comes in. The world doesn’t embrace the kind of self-awareness that living authentically requires, and it’s not something we’re taught. It’s something we must actively create in our own lives. Living a life of authenticity requires you to really know yourself. Not just who you are, but who you want to be, both in what you value and what you stand for. And here’s the hard part—it means you have to accept all of you...the good and the not so good and all the imperfections that come with being human. Instead of hiding behind a mask, living authentically forces you to not only acknowledge all that you’re made of, but to celebrate it. You aren’t just accepting who you are, you’re reveling in it. This means that being authentic requires vulnerability, and ultimately, requires being genuine. In a culture that emphasizes a “Fake it till you make it” mentality, there is no better time than now on learning how to live more authentically. But how do we do this? 1. Live the life you love, not the one you think society accepts. Begin to act in a way that aligns with your values, beliefs, likes and dislikes. If it isn’t you to attend the biggest soirees, stop attending. Or only attend when it feels right. People pigeonhole themselves and don’t allow themselves the latitude to do what feels right in the moment. Just because it didn’t feel right yesterday doesn’t mean it’s not right today. Above all, be genuine to who you are. 2. Accept your strengths and your weaknesses. Sorry to be the party pooper, but you can’t be amazing and perfect at everything! Just be yourself because nobody can do that. And be your own ideal, not someone else’s! 3. Allow yourself to be vulnerable. If that’s uncomfortable to you, start small. Find someone you feel comfortable with and allow them to see your vulnerable side. Or better yet, take a risk and put yourself out there and let others see who you really are. It’s freeing just allowing yourself to be. If you want more intimacy in your life, take a chance and be vulnerable. 4. Dump the homophobic messages you received growing up. These aren’t yours to carry anymore. Imagine yourself writing these messages on a piece of paper and tossing them into open flames. It’s time to release this baggage because it’s weighing you down and creating obstacles to living authentically. 5. 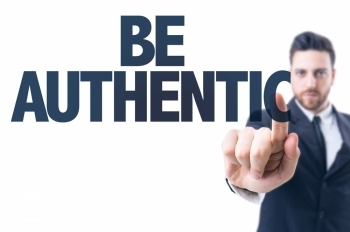 Make a note when you’re acting inauthentic. Take some time to reflect on these experiences. Get to know yourself at a deeper level and what might have driven you to act inauthentic. When we have a deeper understanding of who we are, we can tell when we aren’t living according to our own values and beliefs. In those moments, have the courage to examine your behavior and reflect on the experience so you can identify the triggers and better arm yourself against them in the future. Gaining self-knowledge is so important in becoming more authentic. 6. Take some time with guided meditation. Guided meditation is a deep state of relaxation by the use of a guide. This is usually a calming experience and will open your mind. Having an open mind typically allows a person to see the bigger picture and many perspectives. So often we can find ourselves getting stuck in a rut because of how we might view or think about ourselves, others, and the world. If this is something you resonate with, mediate and you might be surprised to learn some things about yourself! Living authentically requires a great deal of work, but overtime, you’ll soon find that just being yourself is pretty easy. I think Brené Brown sums it up quite well when she says, “Authenticity is a collection of choices that we have to make every day. It’s about the choice to show up and be real. The choice to be honest. The choice to let our true selves be seen.” I’m learning that there’s nothing sweeter in life than living a life of authenticity.